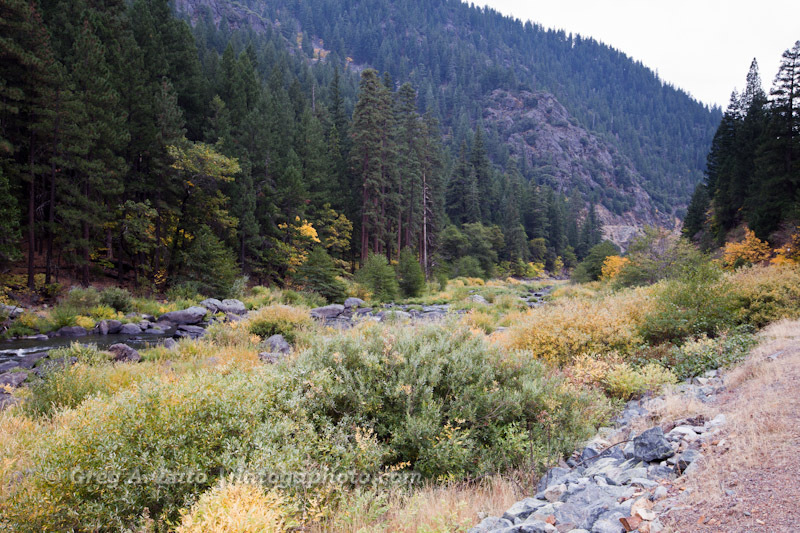 This past weekend the family and I did a trip up to Plumas County, CA to check out the fall colors. We had driven through the area five years ago on a trip from Lassen to Yosemite. During that trip we saw plenty of color along the highway, even though it was cloudy and drizzling, but we didn’t have time to explore the area. We always wanted to go back. And this weekend we did. Plumas County Leaf Peeper’s report, available in my Landscape Location Reports list, is updated daily during the fall by the county visitor’s center staff. They do a good job of giving updates and are helpful to guide you to various out of the way shows of color. But they can’t predict the color, just report on it. And this year it seems to be running a bit late. In general, you’ll see spots of yellow and red around the county (more further north or at higher elevations) but in general the trees need another week or two to get closer to peak. 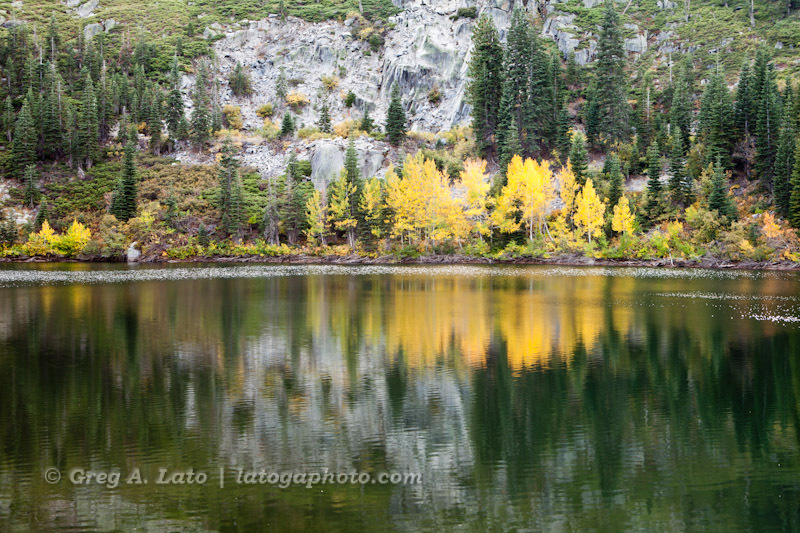 For those who are familiar with color in the Eastern Sierras, Plumas County offers a more intimate view of fall foliage and requires a bit more time off the main roads to find it. Part of the fun is exploring! The following list is a general report from the various areas that we drove through (and day(s) visited). See the handy Fall Color Tour Map (pdf) for reference to locations/highways. This is a handy map to save to your iPhone or iPad for reference while on the road (though for some reason the Foliage Guide part of the map doesn’t display correctly on either device). 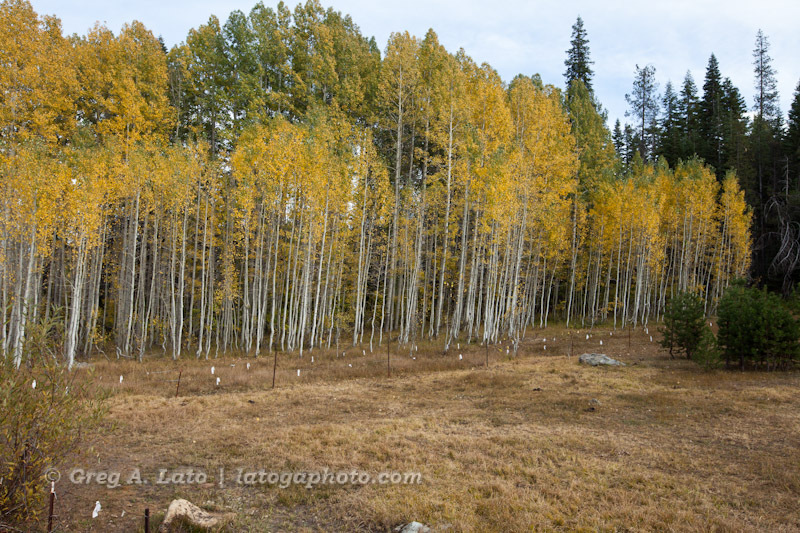 Gold Lake Highway and Gold Lake (Friday): The few patches of Aspen and Willow that I spotted along this scenic mountain pass were just starting to hint at yellow, but were mostly green. Highway 70/89 from Cromberg to Quincy (Friday): Most of the trees along this stretch were still green. Downtown Quincy (Friday/Saturday): The large population of decorative trees within Quincy that change color were still just starting to show signs of color. There were a few odd trees that were in full color (a few even having lost half their leaves). It looked like another week might have the majority of the trees in Quincy approaching peak. Quincy to Bucks Lake (Saturday): There are two roads to get to Bucks Lake from Quincy: Bucks Lake Road takes a higher elevation route along the ridge line and contains spots of color along the road; Big Creek Road follows the creek bed in the valley and has very little color from along the road. Once you get to Bucks Lake, there are just spots of color in the various locations around the lake: Thompson Lake has a small grove of Aspen that are mostly yellow right now; Sandy Point boat launch area has a small grove of Aspen as you enter that are yellow. There is also a grove of Aspen near Haskins Bay that are mostly Yellow (though the younger Aspen seem to have lost half their leaves already). Highway 89, Canyon North of Junction with 70 (Sunday): this canyon is showing larger sections of yellow, mostly in the shrubs along the roadway and river bed. Round Valley Lake (Saturday): The shrubs around the lake are just starting to turn shades of yellow. There is one lone tree across the lake that is yellow and stands out nicely against the pine forest. Chester (Sunday): Like Quincy, there are isolated decorative trees in town that are either at peak color or transitioning to peak (red tips with green cores). The wider Chester area is still just starting to turn to light shades of yellow. Highway 70, Feather River Canyon Highway from Junction with 89 toward Orville (Sunday): Like the rest of the main highways, there are spots of yellow closer to the 70/89 Junction but quickly turn to full green as you continue down highway 70. As you continue descending highway 70 you will spot groves of Aspen turning Yellow and Orange higher up in elevation on higher hillsides of the canyon. Just like leaf peeping in the Eastern Sierras along Highway 395, Plumas County contains many locations for potential color but you have to drive around to get to them. Unlike the Eastern Sierras a bit more hunting, and investment in time and gas, is involved to locate the groves of color as they seem to be smaller in scope and don’t allways fall along the roads and rivers. My estimate for Plumas County is that things should be getting closer to peak in general around the area within the next week or two (weather permitting). I’ll be posting a few more photos from the trip over the next few days.